It’s 10 am. Shanno Sidiqui has sent her three children to school and completed all household chores. The 30-year-old knows what she has to do next. She pulls out mounds of threads piled on the porch of her small three-roomed brick house and gets to work. In the next four hours, she will spin out 50 kilograms of these threads or katran (extra threads snipped off saris) into colourful yarn. Each kilogram of this woven rope will fetch her Rs 80/ at the local market, four times the sum she has paid to buy katran of the same weight. “These are discarded thread from looms. They are of no use to the weavers. But for me, these unwanted threads have changed my life. I have been able to send my children to a private English medium school and also been able to build my own house,” said Sidiqui. Sidiqui is not the only one. Many marginalised women in Jamgaon, a small village in Uttar Pradesh, 74 kilometers from Varanasi, are weaving a new story in their lives. Threads (katran), which become superfluous once a sari is woven and considered worthless by weavers, are helping women from economically and socially backward communities pull their families out of poverty. While economic empowerment has been the primary focus, the women have also quietly managed to weave communal harmony through this process. Traditionally, an art practiced by the Muslims, women from this community showed great heart by sharing their skills with women from all castes and communities and enabling them to boost their incomes. It all began five years ago when Sidiqui was looking for ways to augment the family income. Keeping the home fires burning with the income earned by her husband Kalim Sidiqui was becoming difficult. Her husband worked on a powerloom in Varanasi. He managed to weave three saris in the 12 hours he worked every day. For this he received a paltry amount of Rs 375. “I could work for 12 hours continuously only if there was electricity. Power cuts were very common. So actually it would mean working for more than 12 hours. My income was dependent on the number of saris I could weave in those 12 hours,” pointed out Kalim. Considering the hours of work and the distance from his home, Kalim had to rent a room close to his place of work. Although this was a strain on his finances, Kalim had no choice. He was also unable to visit his family as often as he wanted. On occasions when he came home, Sidiqui could see the long hours and hard work was beginning to tell on Kalim’s health. So, in 2012, when Sidiqui, mother of two small children and pregnant with her third, heard that being a member of a self-help group (SHG) could facilitate thrift and credit, she jumped at the idea. “Sidiqui had studied till Class 5 and understood the importance of saving. When we were helping women form self-help groups in Jamgaon in Sonbhadra district, Sidiqui was among the first to become member. She also persuaded other women from her community and neighbourhood to join. Once the first SHG in Jamgaon was formed, it set the ball rolling for other women. They overcame their hesitation and came forward,” recalled Ram Naresh, field officer, Rajiv Gandhi Mahila Vikas Pariyojana (RGMVP), a not-for-profit working for women’s empowerment and poverty alleviation. The RGMVP is working in 51 districts in the state and has so far mobilized over 1,500,000 women, facilitating the formation of over 132,000 SHGs. In Jamgaon, during the SHG meetings, women were also given information by the organisation about various livelihood options available to improve their financial status. They were encouraged to become economically independent by taking loans from their SHGs to start income generating activities. Sidiqui, who had learnt the art of turning katran into yarn before marriage from her maternal uncles employed in this business, decided to try her hand at it. She took a loan of Rs 5,000 from her SHG and bought 50 kgs of katran. Since converting the katran into rope initially required deft hands, Sidiqui didn’t need to invest in any loom. By intertwining the threads between two wooden rods, she used her hands to twist it into rope. So profitable did this turn out to be that within six months, Sidiqui was able to repay the loan. Buoyed by her success, Sidiqui asked her husband to leave his job and join her so that they could roll out a greater volume of rope. “This way we could be together and also earn more. He agreed and has been working with me for the past five years. Now, we buy 1500 kgs of katran every month. But had it not been for the SHG, I could not have started my business or even dreamt of a better life,” said Sidiqui. It was not just Kalim who realised the worth of the business. Neighbour Farzana Khan, a member of another SHG formed with RGMVP help, saw the change in Sidiqui’s life and decided to follow in her footsteps. “I saw her transformation and was inspired. So, I asked her to teach me so that I could also give my family a better quality of life,” said Khan. Once she learnt the ropes, Khan began getting good returns. When she realised that she could double her profits, Khan took a loan of Rs 10,000 from her SHG so that she could buy greater quantities of katran. 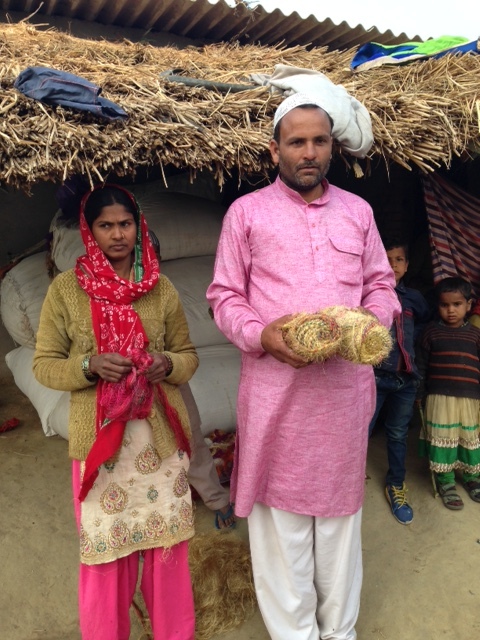 Khan’s husband, then working as a daily wager having been laid off from the loom in Varanasi, joined his wife. So good has been the income that he hasn’t needed to look for another job. Sidiqui initially taught her extended family and neighbours, all belonging to her community. When Hindu women from the SHGs expressed their desire to learn and earn, she had no qualms in teaching them too. Rita Devi and Bindu Devi are among the 20 women who have learnt this trade so far. For Rita, this additional source of income has helped her to provide her three children better nutrition. “Both my husband and I are daily wagers. But our earnings are not enough to feed my children good food. But now I can afford to give them a better life as I have the skills to earn more,” said the 28-year-old Rita. Unlike Rita, who is uneducated, Bindu Devi, 30, studied till Class 5. But she never got the opportunity to put her education to use. She and her husband are also daily wage labourers, so when the SHG was formed, it proved to be more than a boon for her. Not only did Bindu get elected as its treasurer, being one of the few educated women in her SHG, but she also learnt the art of making rope. 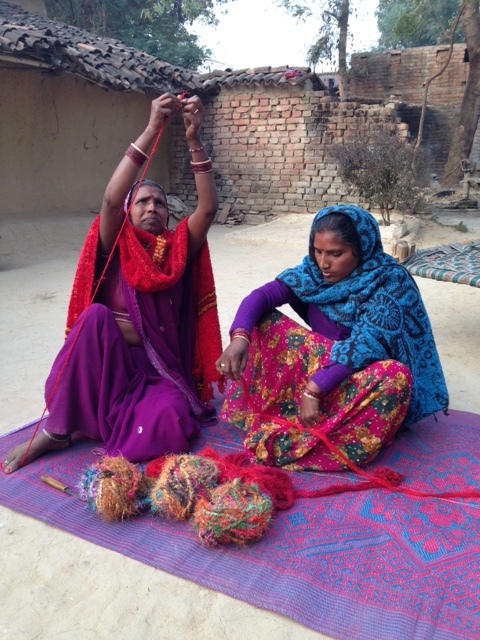 Bindu, who has been weaving since the last three months, is able to twist three kgs of rope in a day. “I have five children and my husband has been ill for some time. Had it not been for this extra income, I don’t know what I would have done,” she said. Sidiqui knows how tough it can be, having been through a similar experience. So, she is now outsourcing some of the initial work to 10 other women. Depending on the quantity of katran they are able to twist into ropes, she pays these women a minimum sum of Rs 50 daily. Last year, Sidiqui’s entrepreneurial feats won her an award from the government’s Aajeevika programme under the National Rural Livelihoods Mission (NRLM), a flagship initiative of the Ministry of Rural Development, for empowerment and promotion of livelihoods of poor rural women. By weaving wealth out of waste, women in Jamgaon have shown that they can become game changers. Swapna Majumdar is an independent journalist writing on development and gender. She is based in New Delhi.